Gandhi's invocation: you must be the change you wish to see in the world, reminds each of us to take our share of responsibility, that we need not accept injustice merely because we feel powerless against the might of others. Mohandas Karamchand Gandhi was born in Gujarat in 1869, the son of the diwan, or first minister of the city of Porbander. His mother, a devout Hindu, imparted the tenets of tolerance and respect for all religious beliefs which would shape his life. 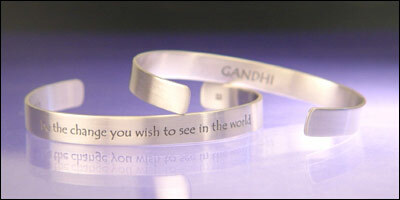 We are very happy to be offering this beautiful sterling silver bracelet featuring Gandhi's famous invocation, reminding us to take our share of responsibility, to not merely wish for change but be the change. A lacklustre legal career in Bombay and London eventually took him to South Africa, where his resistance to the ill treatment of himself and the Indian and Black communities generally, began to crystallize into the ideas and methods for which he is revered today. Satyagraha, in Sanskrit means pursuit of the truth, and by extension the philosophy of non violent resistance against tyranny. This philosophy was first formulated by Gandhi in Johannesburg in 1906 as a tool to oppose the Transvaal government's plan to require compulsory registration of all Indians. After over ten years in South Africa, he returned to India in 1915 to set up his ashram appropriately called Satyagrah Ashram. From there his campaigns against the oppression of the poor by landowner and authority led to the eventual goal of freeing India completely from British Imperial rule. His achievements through peaceful methods led the people to address him as Mahatama, or great soul. In over thirty years of this struggle Gandhi remained constant in his devotion to satyagraha, truth and ahimsa, non-violence; his ministration throughout condemning acts of violence from whatever source. Mohandas Karamchand Gandhi was assassinated by a Hindu radical in 1948, less than a year after Indian independence was achieved.